Putty Connection Manager can be used as tabbed version of Putty. It works on all the editions of Windows OS i.e Windows XP, Server 2003,Vista, Server 2008 and Windows 7. This article describes how to use Putty Connection Manager to simplify the login process to different telnet or ssh servers. Please follow the below given steps. Download and install the latest version of Putty Connection Manager from here: Download link for PuttyCM. Launch Putty Connection Manager. It asks for the location of Putty.exe. Specify the location and press OK.
Now you can see Putty connection manager window as shown below. Now the first thing we need to do is creating a database where we can store information of hosts and login parameters like username and user password. For this Click on File then New and then Database. Give some name to the database and create the database. The next thing is to create a connection. Click on File and New and then Connection. Now select Login Macro from the left side pane. 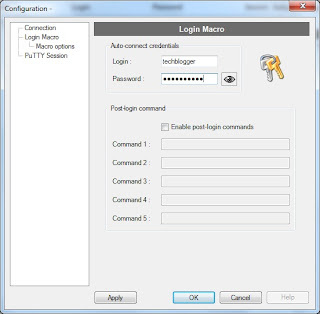 Enter username and password using which you want to connect to the remote computer. Next it asks for destination folder. Select SSH or Telnet depending on the connection type. That’s all you need to do. After dong the above steps you can see connection manager mini window on the right side where you can see an entry for the connection we just created. If you do not see this you can make it visible by clicking on View and then clicking on Connection Manager. In the connection manager mini window double click on the connection name and it will open a putty session to the host specified in the connection settings. It will automatically supply username and password to the remote host. With in 2 to 3 seconds you can see command prompt of the remote machine. I have started using this tool very recently and have liked it very much. One problem I have faced with this tool is that sometimes it supplies the password as username. After googling I have found that other users are also having this issue. Whenever I face this I just close the window and open a new window. Puttycm provides keyboard shortcuts to switch between tabs and to open new windows. These default keyboard shortcuts can also be reset. You can do this as follows. To redefine the shortcut for any operation select the operation entry from the list and then use the New shortcut box provided in the bottom. When I minimize Puttycm window it disappears. I can’t reactivate the window using ALT-TAB too. If I try to start the application again it says ‘Application already started’. How to fix this? Select General from the options in the left side pane. Now in the right side you can see the check button ‘Hide when minimized’. In this case this would have been enabled. Unselecting this button will solve the problem. Above tip has solved my problem. I am having one more issue now. After I minimize Puttycm windows if I try to reactivate the window by clicking on the Puttycm icon in the taskbar, it does not activate the window sometimes. I created a database and created new connections. But I do not see the connections after reopening puttycm, what happened with the old database I created? How to encrypt the database file? Storing passwords in plain text could be a security issue? There is no in-built feature to encrypt database looks like. There is a check button ‘Enable database encryption’ in Database-> Properties but it’s greyed out. May be the feature is not yet implemented. Where are Puttycm’s registry keys stored ? How to disable Ctrl-R binding? Ctrl-R is a shortcut for searching command history in linux. But doing Ctrl-R in Puttycm opens up tab rename window. How to fix this? Is PuttyCM working fine for you ? Please share your experience in the comments. For some reason Menu is missing in Putty connection manager window. How can I restore it? Right click somewhere in the grey colored area just below the blue bar in the top. you can see that 'Menu' is not selected. Check it on by clicking on the same. Now you will be able to see the menu. I have changed login and password in the macro login in the configuration settings..but the changes are not being saved..
After entering login and password you need to save the database. click on File and then save database. After creating the database you should be able to see an entry with the database name in the connection manager snapin in the right side of the main window. For me the short cut keys cease to work very often. I have to restart the putty connection manager to have it fixed. This is so frustrating that I am thinking of stopping puttyCM usage and search something else. Is this any kind of a bug with puttyCM? I have never faced such an issue …Are you using the latest version 0.7.1 beta (build 136)..
As a last option I would suggest to uninstall puttycm and do a fresh install.. This is some very buggy software. I think I will be trying something else. I'm using Windows 7, and I managed to make it crash by simply selecting selecting 'Putty Sessions' from the menu, after having previously closed the Putty Sessions window. I can make the software crash every single time I do this. Also, unless you disable the 'Hide When Minimized' option, then you'll be stuck (at least in Windows 7) if you minimize the program. You won't be able to get it back! If you click on the icon in the desktray, nothing happens! It's a real pity because Putty needs something like this that works. Is there any possibility to save commands and reuse later in Putty CM ? You can try uninstall and reinstall. If you have a lot of host entries created in connection manager you can reuse the data base file with the new installation so that you do not have to add all of them again. I have tried uninstalling and re-installing but that didn't work. As I said, I moved this from another directory where there were permission problems. The uninstall seems to be leaving something in the registry outside of the HKEY_CURRENT_USERSoftwareACSPuTTY Connection Manager key. I have tried using a registry cleaner but that didn't fix it. 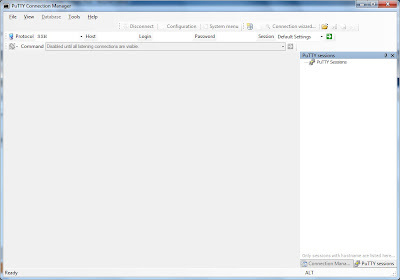 Sorry..I do not know of a solution to your problem..did you try searching for the word putty in registry editor? If you can't solve the problem with puttycm, there is another utility similar to that..
when i minimize the puttcm window and open some other windows like word, excel and then again click on puttycm window, it does not get restored on the first click. i sometimes need to click it twice or thrice to get the puttcm window restored. this is sometimes annoying. does any one faced this issue before? anybody has any solution? that is a known problem..Looks like it is not fixed yet..
Is there any linux equivalent for puttycm that can have preconfigured login sessions and can be connected with a single click? 3. Uncheck "Show tray icon"
5. Click on any connection in PuTTY sessions tree. 6. Error message "Unexpected error occured…"
09-Feb-11 14:08:40: Error : Object reference not set to an instance of an object. 9/15/2011 1:42:05 PM: Error : Object reference not set to an instance of an object. Tried several uninstall / re-installs, same issue. Tried running as administrator, same issue, even in compatibility mode (winxp sp1, winxp sp2, win vista), same issue. There does not seem to be any solution available for this issue. Keeping the 'show tray icon' selected is the only way to not get into the problem. Some one posted in a forum that this issue does not occur if you are logged in as administrator of the machine. I have not verified it though. But this is not a feasible solution for domain users. While bringing back the application after beein minimized is something you can workarround yourself, i found a problem i could not get rid of: i can't type in the putty session, only when using Listen for MCS Commands… That realy suxx!!! That is working for me..I have enabled mcs commands and I am able to type in the session as well as in mcs command text box..
all Putty sessions apear (start) in a new putty windows, after selected from database, not in the window of Putty connection manager. is this issuse know? Puttycm is not working as tabbed terminal for you?..That's strange..I don't know of any solution to this problem..You can Try uninstall and reinstall of puttycm.. Even I am facing the same problem. Suspecting problem with Dot Net. Also whenever I am launching the PuttyCM, it throws some error for fraction of seconds and disappears. Couldnt read that error. BTW, how to find the dot net version being used by putty, how to change it/upgrade it?? Did you try to change the background colour through the putty menus and save the profile? That works for me. Thanks Kittu..I got it now.. Earlier I tried the colors menu in putty but I missed to save the settings as the save button is under a different node in the putty menu. all Putty sessions appear (start) in a new putty windows, after selected from database, not in the window of Putty connection manager. is this issue known? Looks like the solution for this problem is to select the check button 'Enable additional timing for putty capture' in Tools -> Options -> Putty . I am not having this issue so could not verify if it works..
i found this setting a few hours after posting here. thanks for your help. I cannot configure session to open within the CM window as a new tab. Each new session opens in a separate window as if I was using Putty alone with the CM. I tried the option you detailed, but it does not resolve this issue. I keep trying. and there are no files. When I activate the Puttycm window and start typing somthing in current session, the taskbar window starts blinking with orange color. This is really bad behaviour of Puttycm. Did anyone face this before? I too have seen this problem.. Whenever there is some new activity happening in a window it usually blinks..for example, the chat windows if the other user sends a message. I think puttycm is assuming the window is inactive and so is blinking I guess.. Even when we restore an inactive puttycm it takes some time to actually render the window. There seems to be some delay in activating/inactivating puttycm windows. This is a very buggy software indeed. Although I have saved the login credentials for auto login, when I click on a saved connection, it auto completes the user field but gives an Access Denied when auto completing the password. So I still have to enter it manually. This feature rarely works. Are there any good alternatives available for putty connection manger..It has significant number of issues that cause annoyance. I need to log into several systems during the day. Usually at the start of the day I just log into all of them at once. It would be really nice if I could just open putty and have it log into all of them at once. I've already got the connections setup so I don't need to do the "new connection" bit but how can I accomplish this? You can do that using puttycm. In the connection manager window, create a folder and move all the server connections you created to this folder. Now right click on the folder and click on 'Connect all'. This would open connections with all the servers listed under that folder. You can also do 'Connect all external' but this one would open puttys outside puttycm. When I try “Connect All” it is grayed out. I’ve got a ton of connections which used to show up on the right hand side but now they are gone. How can I get them back? Sorry, I guess my question should be, how do I move all the connections into the folder? Drag and drop doesn’t work…can’t seem to attach a screen shot. Thank you, really like and needed this program! However, maybe the Tools->Options->General "Remember display configuration" is not working (or I do not understand). Opening all connections in a folder always creates tabbed consoles in one window. I layout the display in 4 separate window console and do my work (thank you). After save all databases, exit and restart there are no connections (wow, wouldn't that be a great feature 'auto-restore last connection set') and after connect all on same folder they open in tabs on one console again. I want the 4 console display layout configuration that I had. These tips are quite helpful. Thanks. The error “registry key ‘HKEY_CURRENT_USERSoftwareSimonTathamPuTTYSessions’ does not exist” is due to the lack of privilege. You must ensure that the puttycm should be installed properly. If you are an Administrator, you may simply add full permission for the putty installation folder to your username. I use ssh keys loaded by pageant to connect automatically. My account name is also set automatically. I would like to set up a command to auto execute every time I login. However to do that I need to go into configuration for the connection and enable post-login commands. If I do that and try to connect I now get a login box where I need to add my account name and a password. So I need to add auto-connect details. Now when I connect I login automatically and then my account name is applied which gets an invalid response, then the password which gets an invalid response and finally the command I want to execute. Is there a way to just do the command or a way to globally set a post login command? I clicked the enable the login macro (auto-login) and post-login commands in my putty CM. My auto login works very well however my post-login command doesn’t work, the command that I put in the first field was “pwd” and it turns to nothing after the successful login. Is there any configuration that I need to setup? I am using Windows 7. Thanks Much. Hello ! Anyone that knows if there is a way that makes it possible to turn off so users cant see the password stored to a specific connection ? The one that is typed in if you right click on the device and choose “Configuration —> Login Macro” I dont want them to be able to push on the eye and then being able to see the password. Any help would be appriciated, and also if it isnt possible in putty connection manager maybe someone can give me a tip where it is possible ! You can use ssh private keys then. All the putty session are closed. I see this issue only when i use putty connection manager. when i use putty i dont see this. I am unable to start putty connection manager. it says “Putty Connection Manager has encountered a problem and needs to close. We are sorry for the inconvenience.” I have tried reinstalling but did not work. nice program, I liked it. now I can log into tunnels and do ssh with just double clicks. i have laptop with win 7,for testing purpose iam trying to access the same local pc through putty connection manager.after installation of this software i tried connect with the connection name but it is giving some error -“disabled untill all listening connections are visible.i am expecting the solution to connect to the local system through putty. I have done a fresh installation of the Putty connection manager. It abruptly closes the putty. 5/8/2012 12:56:47 PM: Error : Object reference not set to an instance of an object. 5/8/2012 12:56:47 PM: at x650e12b2512cbeed.x7fbe3d3b15648174.x765e6a19136b68b9(). In Tools -> Options, keep ‘show tray icon’ selected. This would fix the issue. I did the same as above. But after clicking on connection from connection manager it is opening the session but it is asking the username and password. But infact i already gave the username and password while creating the new connection under the “Login Macro”. By the way i have one more problem, every time renaming the session is little bit difficult. so, i googled for how to rename the window title permanently. I changed the window title as per my requirement under the putty conffiguratioon window -> Behaviour. when i am opening session from putty it self it is opening the renamed window. But once i change the directory in the remote machine , window title is changing. How to fix it..
And is there any way to give the permanent renames to puttycm tabs. Please help me. Every day i have to open 50 putty sessions. It would be more helpful for us. If you are connecting to different machines in those 50 sessions, then don’t configure anything. I have default setup and the tabs are always named with the remote machine names. You need to create a PuttyCM Database to manage all your connections. This way you can launch tabs with the tab names without the need of renaming them if you were to lunch them via the Putty session. Found the solution to annoying “putty connection manager blinks/flashes” issue. It has to do with putty settings and not the putty connection manager. 7) ..in this many seconds -> 999999999999999999999999 as many 9s it will take. I cannot get the auto-connect credentials login macro to work in puttycm. I am using windows 7. Any ideas? You can get the putty connection manager window to be visible if it is stuck in the tray on windows 7 by doing the following. 1. hold down the space bar. 2. right click the puttycm tray icon. 3. let go of the space bar while hovering over the context menu and press alt+tab. 4. keep pressing alt+tab until you go through all the windows and come back to the context menu. 5. click open on the context menu. Awesome thanks!! Just saved me uninstalling this piece of junk product..! did you find any solution to this? The issue is if the connection is slow / if we work on VPN we get this. By performing this, more than one user will be able to use PuttyCM. I am trying to make PCM make logs of the sessions that I am handling, but seems there is no direct way in doing this. I’ve to create the same sessions in Putty then configure it through the sessions in the DB which I have to create if I want to use PCM ! Is there any way in creating logs directly for the sessions in PCM without doing replication of them in Putty ?! I have a question about Auto login feature:- I have Windowns 7, initially when I used auto login, it all worked fine. but now when I am trying to login the session, the password is getting diaplyed at the user name !!! I cant login to the server, and apparently it is a security problem of displaying my password. Anyone knows any solution to this? but still no use., Could someone tell me how to get rid of the default settings and how to get the tabbing back ! I also had the problem of “access denied” message after autocompletion of login and password. I solved it by using the “default profile” of putty in “PuTTY Session” menu. Hi, quick question, since migrating to Lenovo X1 Carbon, PuttyCM does not allow left-click COPY, right-click PASTE. When I go to PUTTY standalone, it works. Anyone had a similar experience ? Searched and searched, couldn’t find anything similar. Hi, could you resolve this issue? I’m facing the same problem. When I configure “Action of mouse buttons” to Windows (Middle extends, tight brings up menu) in putty configuration selection submenu, I unable to use the menu when selecting something in a tab. If you cannot reactivate the window by clicking on the Puttycm icon in the taskbar or you cannot get the context menu by right clicking it, simultaneously press both the left and right mouse buttons on the Puttycm icon. This should give you the context menu you should have gotten by just right clicking your mouse. I am updating my .property through putty ok fine, but next day file content dynamically updated to its default state why? I have about 30 servers stored in database puttyCM. I use “Login Macro” to store connection credentials. But when I change password on servers (LDAP authentication), I need change password in “Login Macro” too. Is way how to do it in bulk for all stored connections? I can´t use private key, its forbidden by servers admin. You can open your database in a text editor and do find and replace. In response to “After I minimize Puttycm windows if I try to reactivate …,” you can also hover over the icon in the task bar. When it displays, click on it to activate the window. I was using putty cm normally, but, suddenly, frame to display login (after click in connection) is totally grey , and i can not see the login screen. Did anybody else got same problem? i already reinstall, delete, downloaded again, and still grey…. Maybe only screen shot would help to show. If you experience the password sometimes coming before the username. Right on the connection in the data base and go to macro setting. Change the value of password more that that of the login and that of command more than the password. It worked perfectly for me.